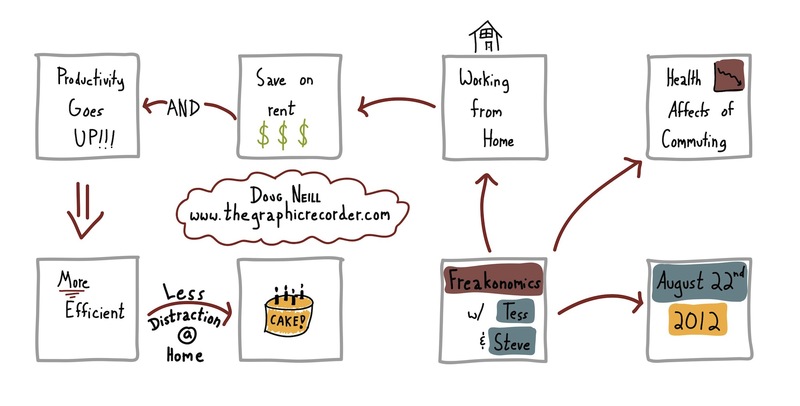 The sketchnotes above are from a recent Freakonomics podcast that discusses the potential benefits of working from home. Seems to me that the key thing about working from home is that you are in control (for the most part) of the distractions, whereas at an office you are potentially bombarded by distractions over which you have no control. Of course the number and validity of those distractions depends on the culture of your workplace. Personally, I prefer working from an office when I’m employed by someone else, but I prefer working from home when I’m working on my own projects (such as this blog!). When employed by someone else, I need a bit more motivation to get things going, which is why an office space with colleagues close by helps. When working on my own projects I have no lack of motivation, and prefer to plug away on my own, allowing myself to be distracted at opportune times in the creative process.